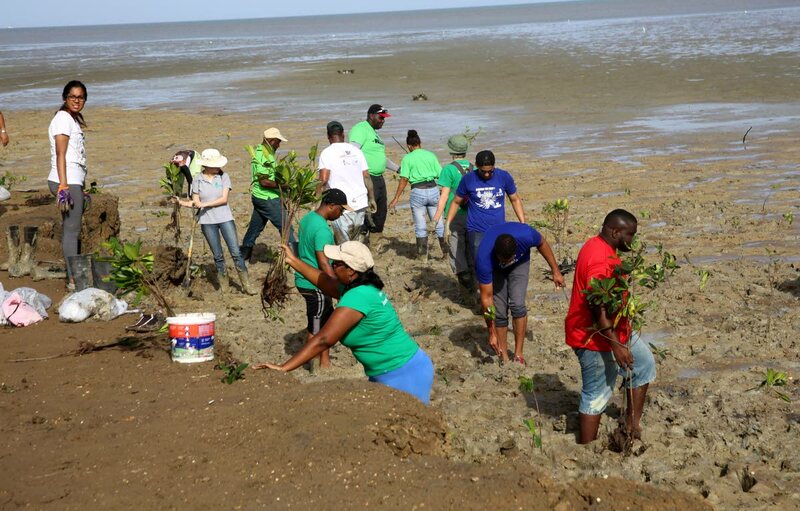 DOZENS of volunteers descended on the Brickfield mudflats, Orange Field in Carapichaima yesterday to plant mangrove saplings in an effort to prevent further erosion along the western coastline. The project is an initiative of the Ministry of Planning and Development through its Environmental Policy Planning Division and the Institute of Marine Affairs (IMA) to commemorate World Day to Combat Desertification which was observed on June 17. IMA deputy director Dr Rahanna Juman, who was busily directing the replanting efforts, said the Brickfield area was chosen because of the evident coastal erosion. She said the mangrove replanting was the first time such a project was done locally as Trinidadians were now beginning to understand the effects of coastal erosion and climate change. She said the mangrove trees helped to protect the coastline by dissipating wave energy and holding the sediments together along the coast as well as acting as a windbreak. “So basically they form our first line of defence against things like storm surge and sea level rise. Juman said the mangrove seedlings being used were taken from the Caroni Swamp near the Blue River which has the same ecosystem as the Brickfield area. The replanting exercise, which was done during the low tide early yesterday morning, was done in the shadow of the famous Temple in the Sea, Waterloo. A small flock of Scarlet Ibis was also seen walking leisurely in the mudflats seemingly looking for food which includes crabs and molluscs, worms and insects.